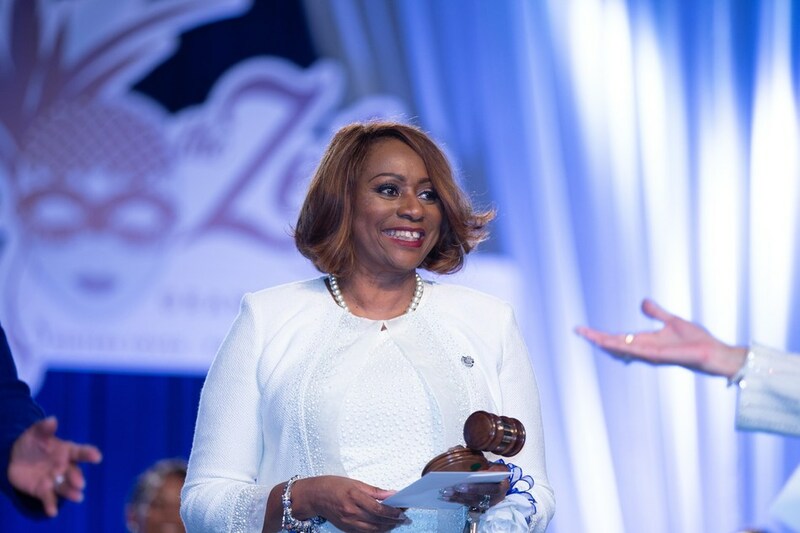 Zeta Phi Beta Sorority, Incorporated, a 98-year-old international women’s service organization, held its Grand Boulé in New Orleans from July 18 – 22, 2018 with the purpose of bringing members together for business meetings, fellowship, community service, and rededication to its founding principles of Scholarship, Service, Sisterhood, and Finer Womanhood. During the Grand Boulé, Valerie Hollingsworth-Baker, Zeta’s immediate past International First Vice President, was elected to International President, and will lead the organization into its centennial year in 2020. The Brooklyn native is the Director of the Inforce Systems Division for New York Life Insurance Company in New York City, responsible for managing multi-million-dollar projects and programs, training personnel, and overseeing new product development as the chief administrator of one of the company’s major subsystems. She is an alumna of Fordham University, receiving a Bachelor of Arts degree at the young age of eighteen. Hollingsworth-Baker has been recognized in the “Who’s Who of Information and Technology” and “Outstanding Women of America” publications. St. Augustine’s Church, the NAACP, and the Hancock T&T Block Association where she serves as the vice president. Mary Breaux Wright, of Houston, Texas, precedes Hollingsworth-Baker as Zeta’s 24th International President. Under her leadership, the sorority held record-breaking fundraising efforts for the March of Dimes, and made notable contributions to St. Jude, the American Cancer Society, Women’s Veterans ROCK, and the Smithsonian African American Museum. Wright also led Zeta’s international expansion, chartering chapters in Belgium, England, the United Arab Emirates, the Bahamas, and Trinidad and Tobago. Zeta Phi Beta Sorority, Incorporated was founded in 1920 on the belief that the social nature of sorority life should not overshadow the real mission to address societal mores, ills, prejudices, poverty, and health concerns of the day. The international organization’s 125,000+ initiated members, operating in more than 850 chapters, have given millions of voluntary hours to educate the public, provide scholarships, support charities, and promote legislation for social and civic change. For more information about Zeta Phi Beta Sorority, Incorporated, please visit www.zphib1920.org.